High intensity UV and BLUE LED light sources are now being employed in UV processes like UV and BLUE light curing. The fully remote controllable 4-channel X1-1 meter features auto-ranging from 0.1 pA to 200 uA or manual range selection, CW, dose, run/stop, offset, auto/manual range and peak hold function. Other standard features include USB interface, backlit LCD and it is compatible with all other Gigahertz-Optik single and multi-sensor (up to 4) light detector heads. The RCH-116-4 style detector consists of a RADIN radiation integrator coupled to a stainless steel rigid tube housing a quartz light guide that pipes the light signal to a detector capsule housing the photosensor/filter assembly. RADIN not only provides a cosine corrected spatial response but along with the light guide and remote detector capsule provides signal attenuation and thermal isolation. The detector assembly is not subject to direct irradiation which reduces ageing and saturation effects and allows the RCH detector to operate in temperatures up to 1000 C (peaks up to 2000 C). 1) RCH-116-4 detector 2) Passive radiation absorber 3) Fiber Light Guide 4) Handle - Photodiode and filter capsule)5) X1-1 Radiometer 6) Irradiation. This high intensity radiometer features a unique horizontally constructed 'wand' probe that keeps the photodetector out of the hot zone. The X1-1-RCH-116-4 UV & Blue Light LED Curing Radiometer is able to maintain stability in high temperature and intense UV flood and spot curing environments. The detector covers the spectral range from 350 - 465 nm with calibration points at key LED wavelengths of 365, 375, 385, 395, 405 & 436nm auto-ranging from 1 to 40,000 milliwatts/cm². 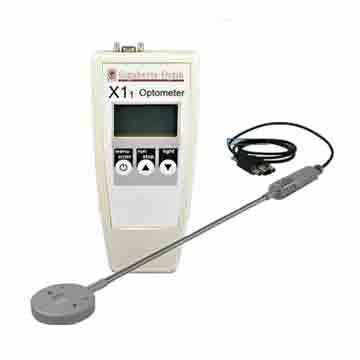 The wavelength for measurement is selected using the X1-1 meter menu function. The low profile RCH detector enables measurement just 8mm above the exposure plane. An Internationally traceable calibration certification describes the calibration procedure, responsivity and traceability. The X1-1-RCH-116-4 Radiometer includes the meter, detector, USB cable, calibration certificate and carrying case. Optional S-X1 software is available. For product specifications and configurable options for the X1-1-RCH-116-4 High Intensity Radiometer, please visit the Gigahertz-Optik main website here. To Order The X1-1-RCH-116-4 High Intensity Radiometer, Call Us Today At 1-978-462-1818. 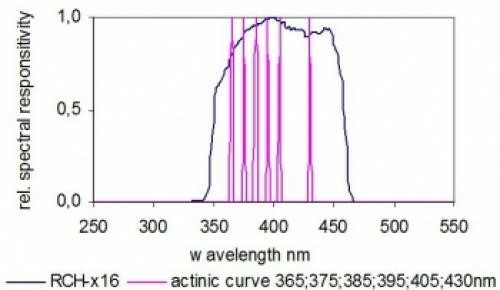 You are researching UV and Blue spectral range LEDs for SSL based radiation curing unit. 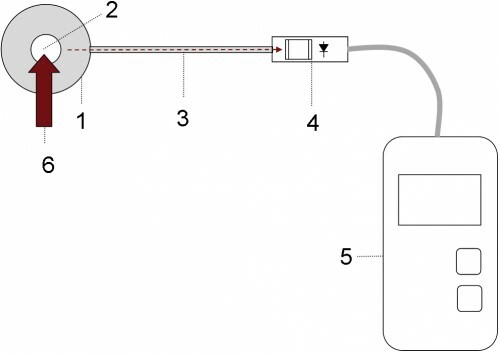 Your current radiometer is not designed for SSL testing. Other standard filter radiometer systems you have looked at would not be able to handle the intense UV levels. Also the detectors are not calibrated at actual LED wavelengths creating large measurement uncertainty issues. And several different detectors would be needed to cover the range of LEDs you intend to test.